We now have an exclusive ASH PAN made for our grates. Makes cleaning the fire a snap. Plus if you ever wanted to use your pit to cook with then this is a must. The fire will be right below the cooking grill and it's adjustable Click on view more images above and see more pics of . THE GRILL IS OPTIONAL AND NOT INCLUDED WITH THE GRATE! All fire pits need some sort of firewood holder or a firewood grate. Most out door fire pits are elevated above the patio and the common height is 24". The problem here is where are you going to build the fire? In the fire pit of course but where in the fire pit? On the bottom? Then how are you going to see the fire? How are you going to clean the fire pit? How is the fire going to bun if there is no air circulation? 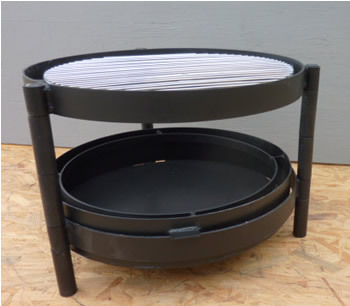 We manufacture an adjustable grate build just for outdoor fire pits. They come in 2 different diameters 18" and 24". The different heights they come in are from 6" to 24". The grates are made so that you can use it as a firewood grate and/or you can add a 22 1/2", out of the box Weber grill that you can purchase from home depot for 10 bucks. So if you ever want to use your fire pit to grill on you can without adding anything but just the grill. But this grill is something else besides a grill. If you wanted the fire wood to stay elevated on the grate longer before falling thru you can use the grill as an addition to the grate. When the grill burns out just throw it away and get another one. See the additional pictures above for a better idea of what I am talking about. In one picture you will see the grate with a piece of expanded metal in the middle about 2" x 4". This is a platform for the fire starter to sit on and you place the firewood above this to light the fire. The next pictures shows the spacers and how you can adjust to grate up or down the legs. We suggest that you use a grate that's as tall as the fire pit will allow. What this does is if you have a fire pit that is 24" and you use a 24" grate and you adjust the grate itself down about 6" from the top surface then the extra height of the legs will be used to keep the firewood from rolling off the side. The grates are made of solid steel. The legs are solid 1" steel legs, the grate ring is made of 1/4 x 1" solid steel rolled into a circle and we weld 3/4" solid steel to this ring to make the cross pieces on the grate. No tools required for assembly. It all slides together. These are very heavy duty. 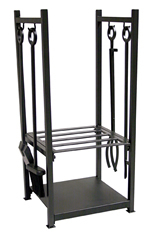 The product pictured above is a 16" tall grate. It has two rings. Grates 16" or taller will come with two rings. All others need and come with only one ring. The second ring is for stability only.